Like so many of my natural beauty brand finds, I first heard about The Earth Works Cosmetics through Twitter a couple of months ago. The Earth Works produce a range of natural skincare products using high quality ingredients, but with a much more affordable price point compared with many other natural companies. 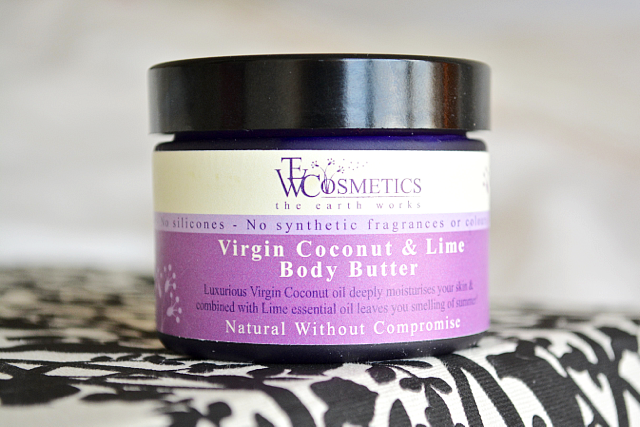 When the brand got in touch asking if I'd like to try a something from the range, I had a browse through their website and was instantly drawn to the Virgin Coconut & Lime Body Butter* (40g £8.00). This body butter is very rich and thick in consistency, so you only need to use a small amount at a time. It's highly moisturising which is great, but it doesn't sink into the skin straight away so I only tend use this when I'm not in a hurry! I would definitely say it's more of a luxurious pamper product than your standard everyday moisturiser! The scent isn't quite as pleasant to me as I expected (I think I was expecting it to smell more like another coconut and citrus body butter from another natural brand I've used in the past!) but it does still smell good and reminds me of summer. I have to mention how much I love the packing of The Earth Works Cosmetics products - the purple coloured glass makes them feel a lot more expensive and luxurious considering the affordable price tag! The full ingredients are listed on the labels (and on their website) too which always gets a big thumbs up in my book! 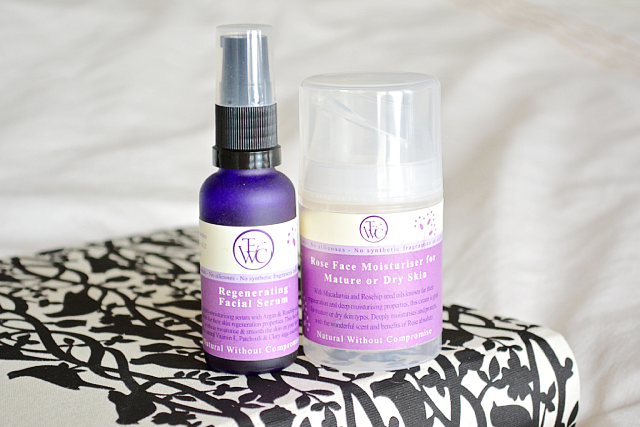 So here's the exciting part for you - The Earth Works Cosmetics have kindly provided their Regenerating Facial Serum (RRP £17.50) and Rose Face Moisturiser (RRP £10.00) to give away to one of my readers! If you'd like to enter, simply follow the instructions on the Rafflecopter widget below. This giveaway is open to UK residents only and will close at midnight on Tuesday 25th February. Good luck! This sounds amazing! The packaging looks very similar to the Neal's yard products, its lovely. This looks lovely great packaging too. Thanks for the lovely giveaway! I'm always looking for new brands to try out, also the packaging looks great too! The matte finish on the blue glass is stunning! Another fab giveaway, lovely. I've never heard of this brand before (until now) but I really like the packaging. The body butter you tried sounds lovely! These sound like a fantastic brand! I love natural products they always smell amazing!! Great prize and love the review, seems more honest than on some blogs! These look great, would love to try. I'm always looking for new face products as my skin can be quite sensitive and dry, especially in this weather. Will have a look at their website now and I love the sound of the coconut and lime moisturiser! This sounds amazing - I love the smell of coconut and lime so I could see myself using this alot. A lovely prize great that The Earth Works produce only vegan products.